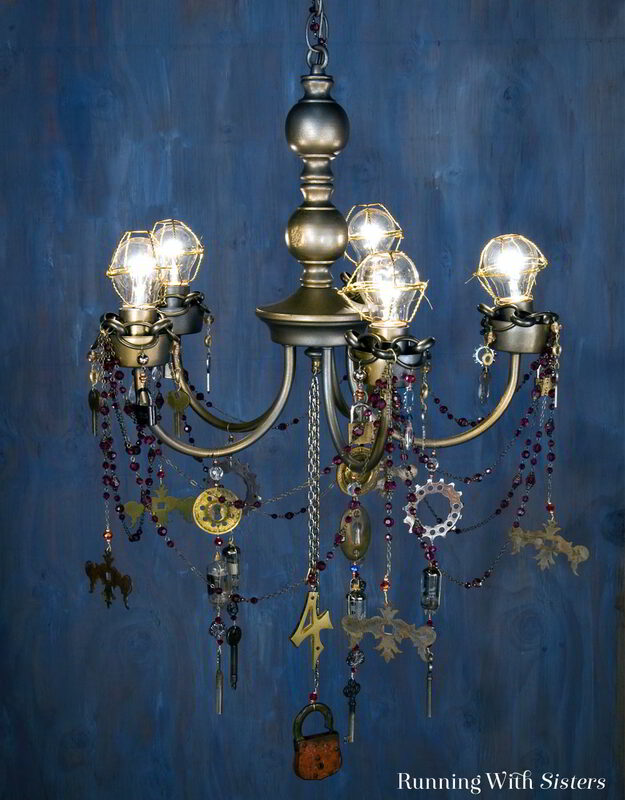 Turn a thrift store chandelier into a Glam Steampunk Chandelier! 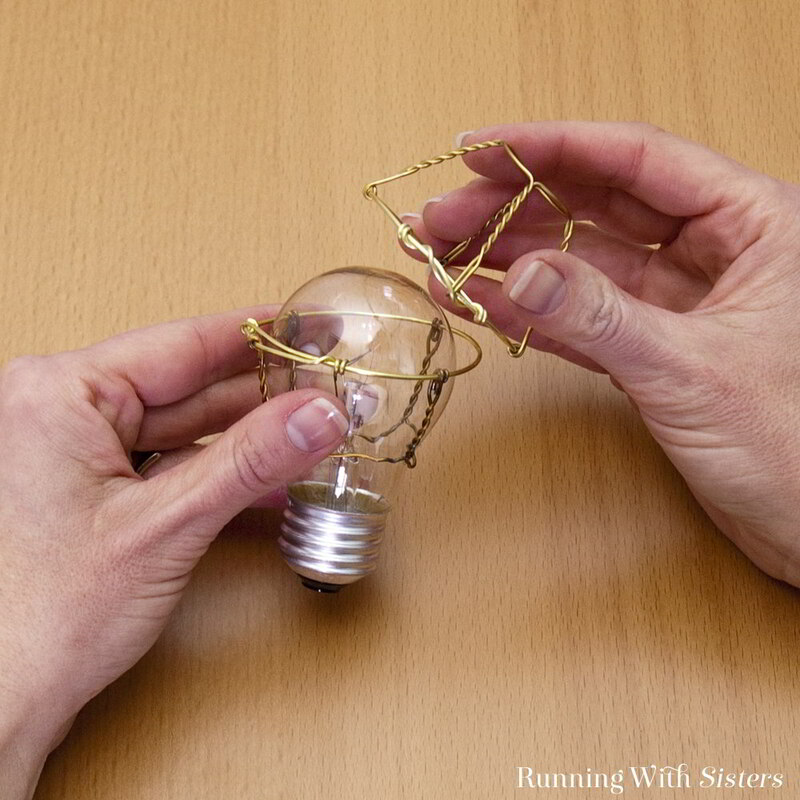 We’ve included specific items and dimensions for the chandelier we made, but you can make your own however you want. Just use ours for inspiration. 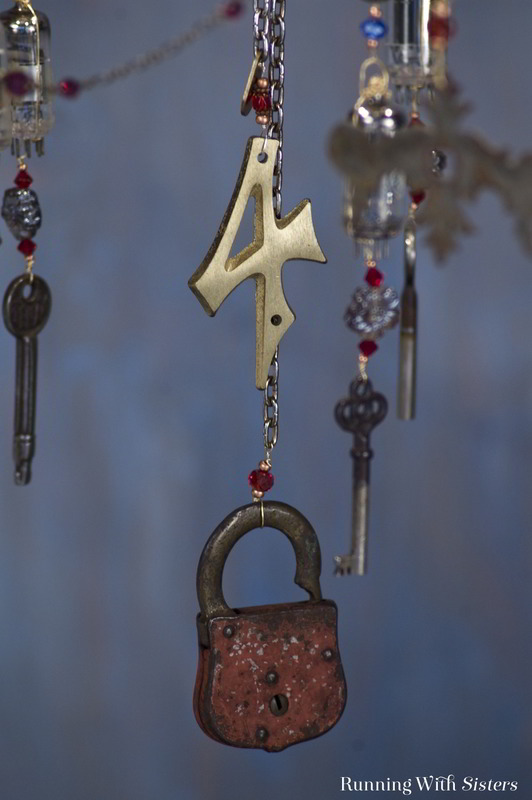 Gather up your favorite steampunky things like skeleton keys, little locks, and even metal numbers. 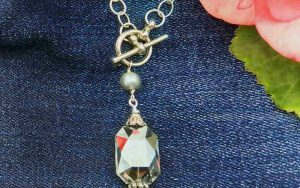 Add beaded chain to make it Steampunk Chic! 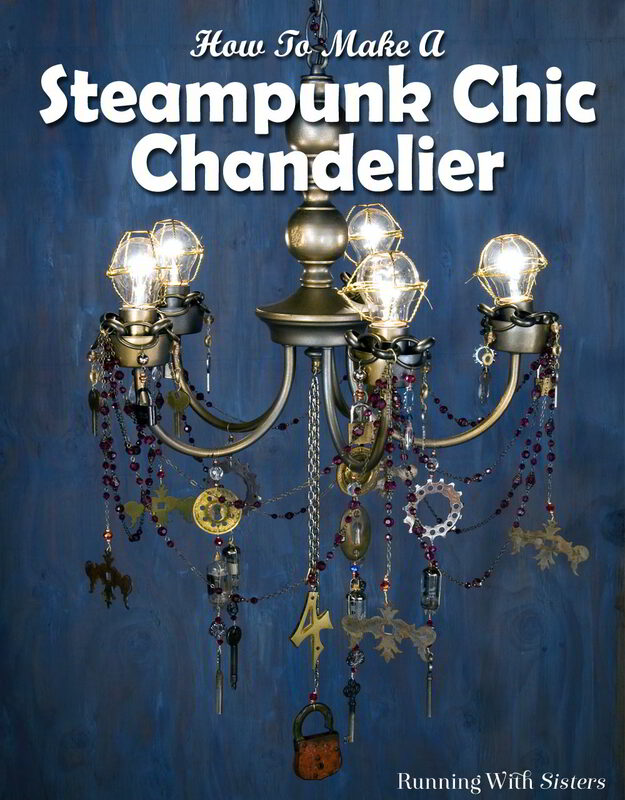 The first step to making a Steampunk Chandelier is finding the chandelier that needs a makeover. We found ours at a white elephant sale for only $5. And it works! These plain old brass chandeliers pop up at thrift stores all the time too. Next gather the steampunk goodies. This part is the most fun! 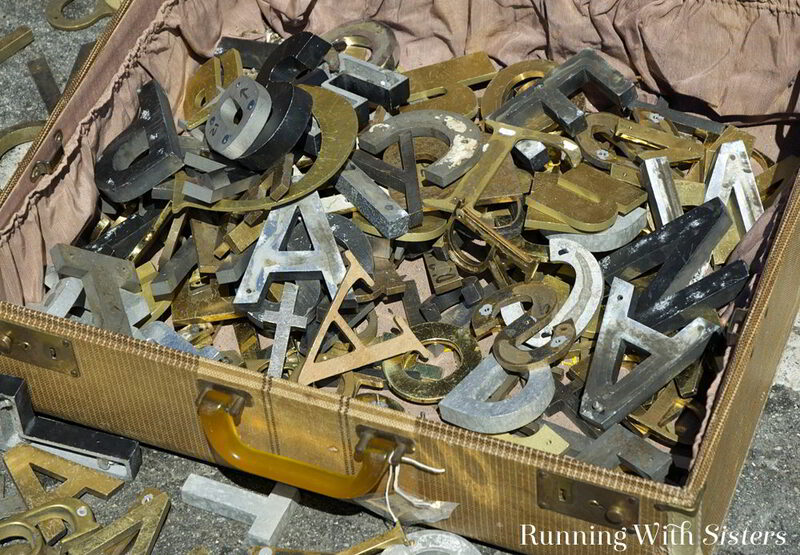 We buy old keys, brass house numbers, and padlocks at flea markets and garage sales. We got the cuckoo clock chain from a clock repair shop. It was free! 1. We like to start by aging the chandelier. Paint the chandelier with a layer of Textured Shimmer Graphite spray paint. To add the look of tarnishing and pitting, spray the chandelier in spots with short bursts of the Hammered Finish Brown Metallic and Gold Foil spray paints. 2. Next we think it’s fun to dress up the lamp sockets. We added fat chain to ours. 3. 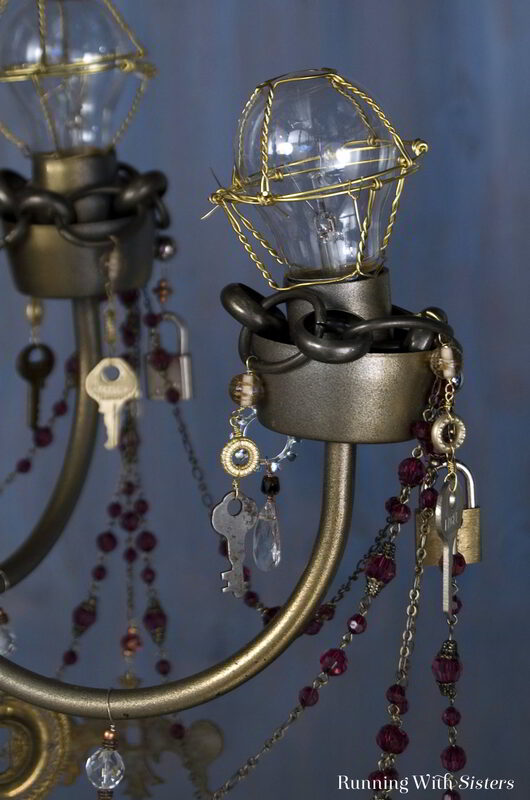 Make four decorative dangles to hang around each lamp socket using small keys, luggage locks, locking washers, and faceted briolettes. 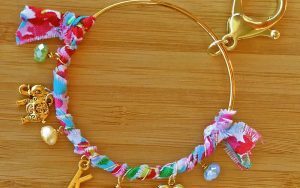 Connect the dangles with wrapped loops using any of the 24-gauge wires. 4. Create large dangles to hang from the five chandelier arms. Ours are made with keyholes, bike gears, furniture keys, and vacuum tubes. To hang the vacuum tubes, we wrapped 24-gauge wire tightly around the top of the tube, down the side, around the bottom pins, back up the other side, then finished at the top with a wrapped loop. 5. Create swags between each socket with 14” and 20” lengths of amethyst beaded chain. 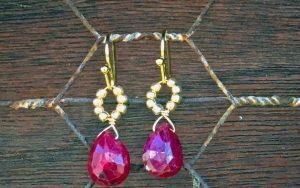 Attach with large brass jump rings. 6. 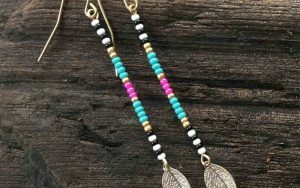 Make a dangle to hang from each jump ring with a 7” length of beaded chain. 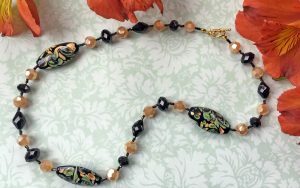 Connect a drawer pull plate to the end of the chain with beads and wrapped loops. 7. 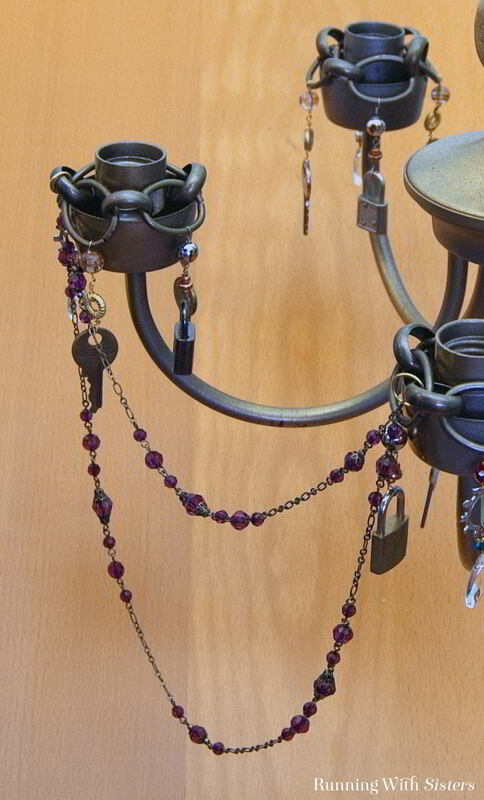 Hang the large padlock from 12” of cuckoo clock chain by wiring chain to the center of the chandelier and suspending the lock with beads and wrapped loops. Hang the house number in the same fashion from 7” of cuckoo clock chain. 8. Create lightbulb cages by wiring champagne cork hoods together. 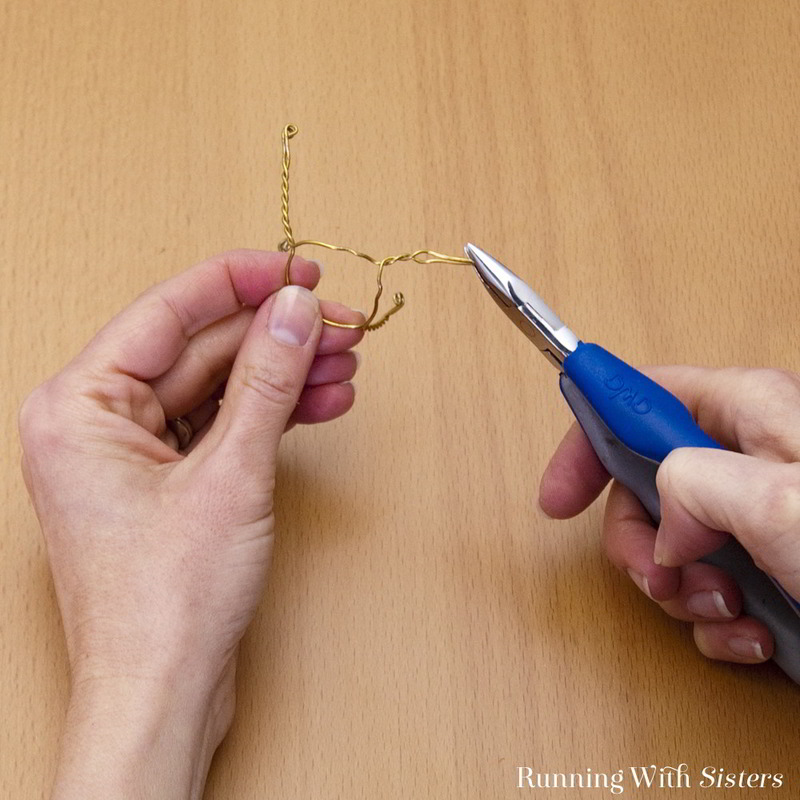 Start by snipping the cork hood collar with the wire cutters to remove it. 9. 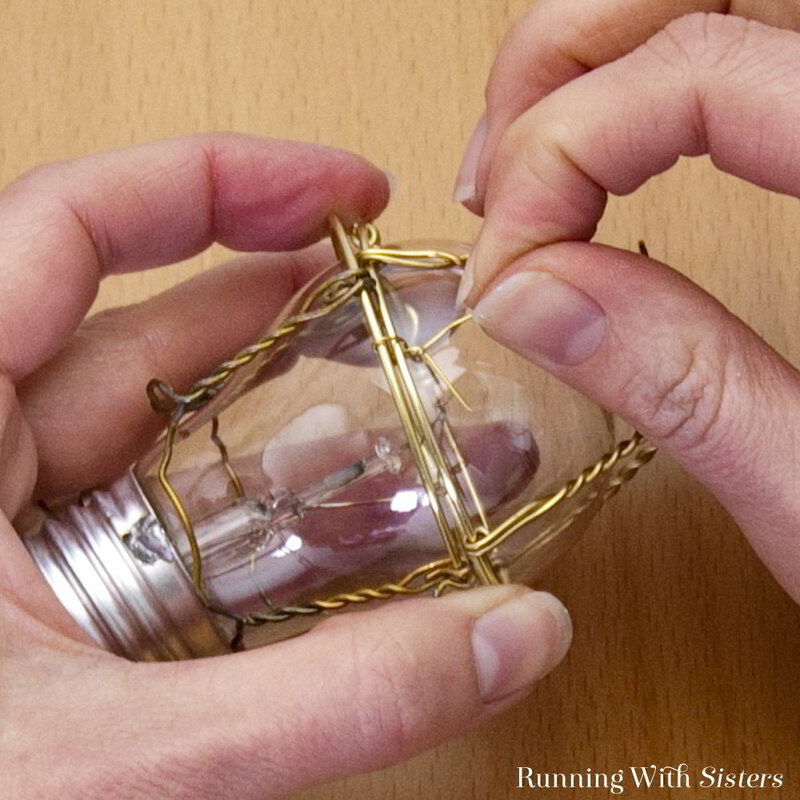 Untwist the wire legs to enlarge the opening for the bulb. 10. Replace the cork hood collar with a 16-gauge wire hoop. Twist the ends of the new hoop together to secure. 11. Fit a bulb through the small opening. Make another modified hood and set it on top. 12. 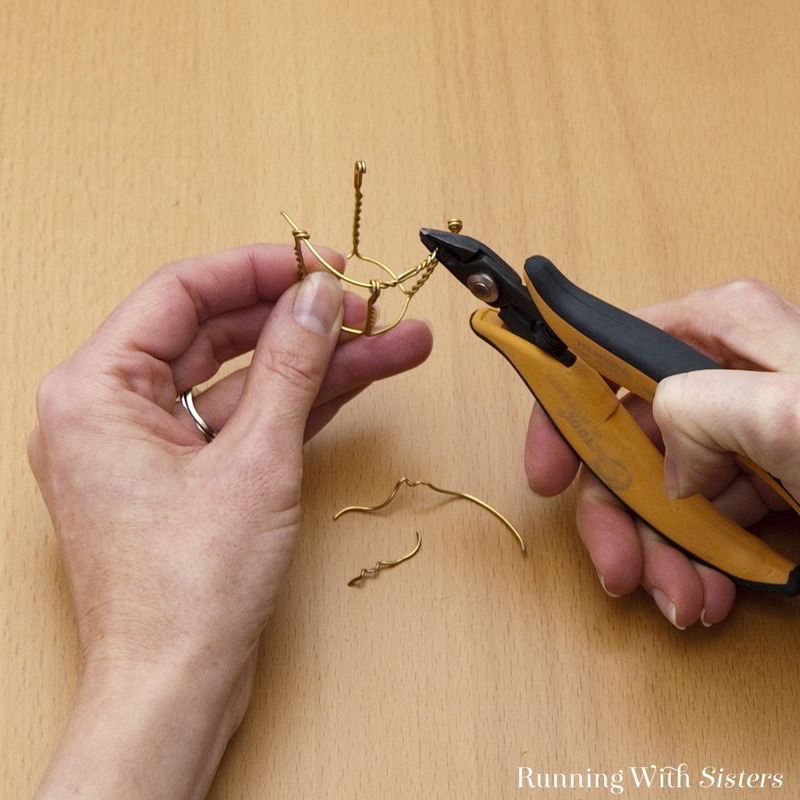 Use short lengths of 24-gauge brass wire to “twist-tie” the cages together. Repeat for all five bulbs. 13. Screw the caged bulbs into the chandelier. Is steampunk your style? Can you tell we love it? There’s something so fun about vintage clockfaces, locks, keys, and gears! Very interesting idea. I’m an artist and I’d like to try it but I’d want to design it myself.